The high point of Lily’s work life is Christos Cyriakos, ex-cop, security guard, possible Greek god. He’s a mystery box she’d love to unwrap. But can she trust him? Lily Lucas is originally from Sydney, Australia, but moved to Melbourne for work. She is a Spritzer (perfume girl), and is the temporary manager of a perfume counter in a big department store. Just before Christmas she has the task of trying to sell the awful new scent ‘Heart Note’. On her first day she meets Christos Cyriakos, the stores new security guard and falls for him, literally. After that first day she can’t take her eyes off him, and it looks like Lily’s luck might just be in. But is Christos really who she thinks he is? Heart Note is a short novella of only 135 pages. I read it in once sitting, and whilst I enjoyed the plot, the gorgeous scenery of a glamorous department store and the interactions between the characters, I did sometimes feel like Cassandra O’Leary had tried too hard to make Lily sound amusing, which in turn often made her seem unrealistic and hyperactive. The book is fast paced, which all novellas should be in my opinion. It has romance running through its core, with an air of mystery and some added drama just to top it off. I loved the ending and I am looking forward to reading book two to see what life has in store for Lily and Christos. 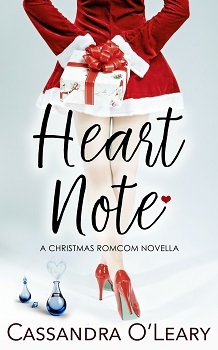 Giveaway is open internationally – prize consists of 5 x ebook copies of Heart Note.